Venerable Dorzin Dhondrup Rinpoche was born in 1969 at Drojug Village in Kham/Nangchen in Tibet. As a young boy he learned how to read and write the Tibetan language in elementary school. He first met his root guru H.E. Garchen Rinpoche in 1984, whereupon he took refuge under His Eminence. He then entered the life of monastic discipline as a monk at Gar Monastery. At the monastery, he trained in all the liturgical recitations including all aspects of ritual practice. He received monastic ordination from Most Ven. Gar Mingyur Rinpoche who also granted him all empowerments, instructions and transmissions of the Drikung Dzogchen Yangzab Cycle. Thereafter, he completed the Yangzab preliminary practices in closed retreat. Furthermore, he received Tregcho Dzogchen teaching from Khenpo Munsel Rinpoche. From his root guru, H.E. Garchen Rinpoche, he received the empowerments, instructions and transmissions of the preliminaries to the Five-Fold Path of Mahamudra, all subsequent stages of the Five-Fold Path, Mahamudra, Dzogchen, and the Six Yogas of Naropa. Following these instructions, he practiced them in retreat over the course of several years. In addition, he received the empowerments, instructions and transmissions of Phowa – the Transference of Consciousness, Yamantaka, Vajrakilaya, the Kagye Deities, Chakrasamvara, Vajrayogini, and many other classes of Tantra, as well as the protectors according to the Drikung Kagyu tradition such as Mahakala and Achi Chokyi Drolma. From Khenchen Tenzin Sangpo he received extensive commentary on the Bodhicharyavatara, the 37 Practices of Bodhisattvas, the Nyingma Domsum Namye, and Phowa. 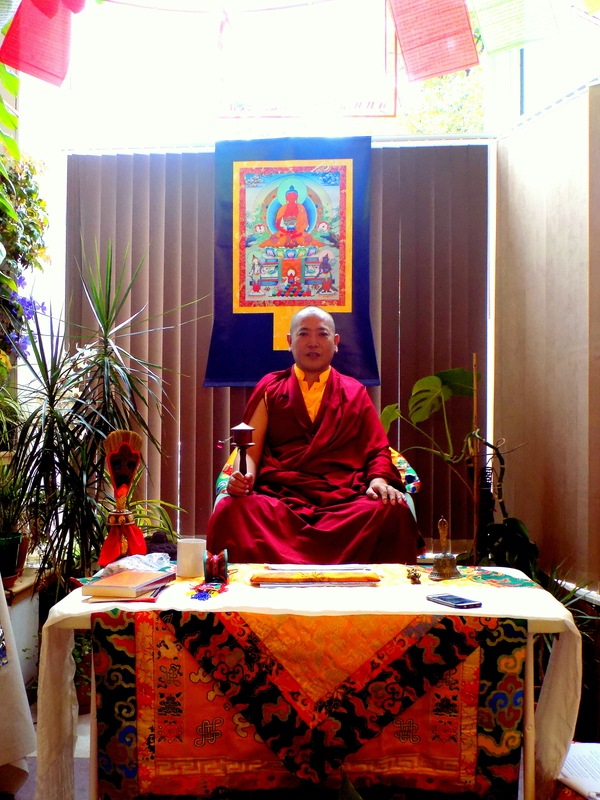 During his stay at the monastery, he has completed several retreats on the nature of mind. In 1994, he arrived in Dehra Dun, India, where he joined the Drikung Kagyu Institute Jangchubling Shedra, where he studied for six years receiving instructions on the Five Major Volumes of Philosophical Texts and Gampopa’s Jewel Ornament of Liberation from Khenpo Togdröl and Khenpo Tashi. From Khenchen Könchok Gyaltsen Rinpoche he received instructions on the major scriptures such as the Gongchik, the Essence of Mahayana, the Uttaratantra, and the Seven Verses of Supplication to Tara. H.H. Chetsang Rinpoche had imparted on him various empowerments, transmissions and instructions, and in particular, instructions on the great collected works of Lord Jigten Sumgön and the past Kagyü masters, as well as the Five-Fold Path of Mahamudra and the Yidam Chakrasamvara. Thereupon, he completed the Five-Fold Path of Mahamudra starting with the preliminaries all the way through Chakrasamvara including the fire puja. In addition, he received transmissions and instructions on the complete Indian texts of Mahamudra, the three Cycles of Luminosity – Mahamudra instructions by Dagpo Tashi Namgyal, the Six Yogas of Naropa, and extensive commentaries and transmissions on Phowa. From Kyabje Trülshig Rinpoche he received empowerment and transmission of the complete Treasury of Pith Instructions (Damngag Dzo). He received various empowerments and transmissions from Chöje Togden Rinpoche. From Drubwang Konchog Norbu Rinpoche, he received instructions on Mahamudra and the Mani (Chenrezig) practice. From Ayang Rinpoche he received instructions on Phowa and together with him engaged in a Phowa retreat in Bodhgaya. He also received various empowerments, transmissions and instructions from the great non-sectarian senior Lamas in India. He concluded his stay in India with a pilgrimage to the most holy Buddhist places in India and Nepal. In June 2006, following the instruction of H.E. Garchen Rinpoche, he arrived in Singapore to support His Eminence in the foundation of the Drigar Thubten Dargye Ling Centre, which was officially founded in 2007. In 2008, H.H Chetsang Rinpoche appointed him with the title Dorzin (Vajra Master). Thereafter, in June 2008, H.E. Garchen Rinpoche performed the enthronement ceremony to recognize him as Dorzin. 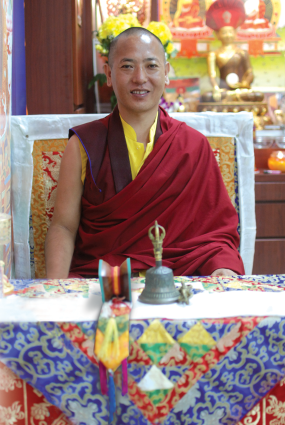 Ever since, he has served Drigar Thubten Dargye Ling as the resident Lama by offering personal counsel and public Dharma teachings to the students in Singapore. In 2011, he took on the responsibility of Gar Relief, a project that offers charitable support to the poor in Kham, Nangchen. According to H.E. Garchen Rinpoche’s instructions, he nowadays also travels to teach throughout the United States and Europe.